Guest (2): My son who lives in America is very Westernized, and as he picked up Gītā, and he tried to understand it, now he now is so much a follower of Gītā that every single letter he quotes Gītā to anyone whom he writes. Prabhupāda: Which Gītā he has read? Guest (2): He’s very convinced about it. Prabhupāda: No, no, which Gītā he has read? Guest (2): Your Gītā and Cinmayananda’s, two Gītās. 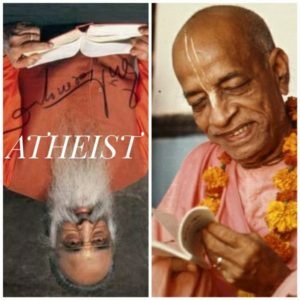 Prabhupāda: Cinmayananda is atheist. Atheist. He does not believe in Kṛṣṇa. Guest (1): Yes, in USA, Santa Cruz. Prabhupāda: Yes, he took some lakhs of rupees from Birla for distributing the Gītā. I know that. Guest (2): He has also translated Gītā. Prabhupāda: He does not present Bhagavad-gītā as it is. According to his own whims. But the original śloka is there. Guest (1): But interpretation is his own. Guest (2): Why have you said Cinmayananda, atheist? Prabhupāda: There are so many statements. In his book there are so many statements. Does he recommend to worship Kṛṣṇa? Guest (2): Does he recommend…? Guest (1): Does he recommend to worship Śrī Kṛṣṇa? Prabhupāda: He is nonsense. You do not know about him, and you are asking about him. That is the pity. “He is supposed to be a great (indistinct).” If you know about him, then speak. Guest (2): No, I don’t know enough about him. Prabhupāda: Then why you are recommending? Then why you are recommending? Guest (2): But he’s preaching religion. Prabhupāda: That means you don’t know religion. Prabhupāda: Religion is to surrender to Kṛṣṇa. But he does not recommend to surrender to Kṛṣṇa. What does he know about Kṛṣṇa? That is the difficulty. He does not know what is Kṛṣṇa, what is religion, and he is preaching religion? Guest (1): He’s supposed to be one of the biggest propagator of Gītā. He had Gītāra Jñāna Yajña in Bombay. There were thousands of people there. Prabhupāda: False, everything false. Misled. He does not recognize Kṛṣṇa, he does not recognize religion, and he is religious. Guest (1): One of the best religious leaders. That’s what people think. Prabhupāda: No, no, that may be, falsely representation, but where he is recommending that “You surrender to Kṛṣṇa and worship Him”? Has he done that? That means misleading. He can become a very good orator, and he can get claps, but what is the benefit? He’s a good orator, there is no doubt about it. But Kṛṣṇa does not say that “You become a orator and cheat others.” He does not say. He says, “Surrender unto Me.” So if actually one is preaching, he should teach the audience that “Surrender to Kṛṣṇa.” And that is reading of Bhagavad-gītā. If I take Bhagavad-gītā and speak something of my opinion, that means I am cheating. I am taking advantage of Bhagavad-gītā, and I am impressing people with my nonsense ideas. Prabhupāda: If you want to cheat others, you cheat in your own way. Why do you take Bhagavad-gītā? Guest (1): Don’t take the protection of Bhagavad-gītā. That is doubly wrong. Prabhupāda: That is great cheating, great cheating. Guest (1): …one should not (indistinct). Prabhupāda: That is the difficulty. Everyone is doing that. Guest (1): Yes. We have many propagations of Gītā in this country. Prabhupāda: He is preaching his own ideas and taking Bhagavad-gītā. Guest (1): Yes. Under the umbrella of Bhagavad-gītā he does it. Prabhupāda: No, you see, something cheating which is going on for long time, to stop it, it will take some time. Guest (2): A friend of mine has surrendered to Cinmayananda. He says he is giving Bhagavad-gītā four hours a day (indistinct). Not for surrendering. Prabhupāda: But not for surrendering. Guest (2): “He is using the Bhagavad-gītā for our day-to-day life.” I said to him, “Why? Why can’t you (indistinct)?” but not surrendering as Swāmījī has said.